Improved with built-in WiFi. Now even more powerful with the new chipset. We have retained all great features and added several improvements. 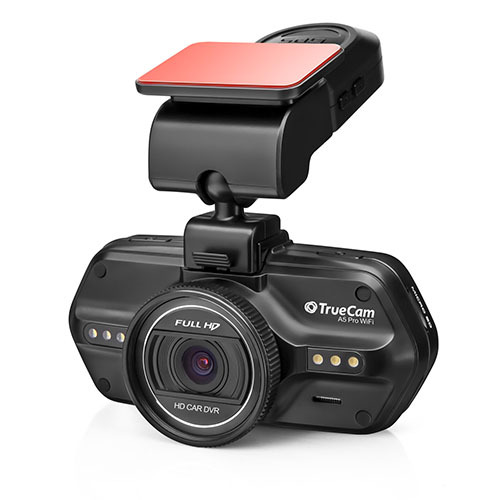 The result is a completely new dashboard camera for your car – the TrueCam A5 Pro WiFi. Challenging situations on the road are always stressful. Our camera will help you solve them with ease and give you peace of mind. With high-resolution recording, you can easily recognize the license plates of surrounding vehicles and faces, day and night, and with the maximum level of detail. You will always have the evidence to make whatever happens. A huge advantage of the camera is the handling, which is simple and intuitive. You just snap it into the holder and do not need to reattach it to the windshield each time you use it. You can also easily remove the camera and take it with you. The new feature with built-in WiFi is designed for even easier editing of your recordings. You do not need to connect the camera to your computer or remove the SD card. Simply download the smartphone application and work on the video right away. Front view of the TrueCam A5 Pro WiFi in-car camera. LED illumination, intelligent mounting bracket and high-quality lens. Side view of the TrueCam A5 Pro WiFi, memory card slot and output for connection to a HDTV or computer. Simple and convenient installation of the TrueCam A5 Pro WiFi onto a special mount, into which the power supply is connected. Quick and simple installation, with the camera you just “snap” and go. The TrueCam A5 Pro WiFi controls are intuitive, fast and in English. The most important functions can be activated at the push of a button whilst recording. Protect yourself and your car on the move with a TrueCam A5 Pro WiFi camera. 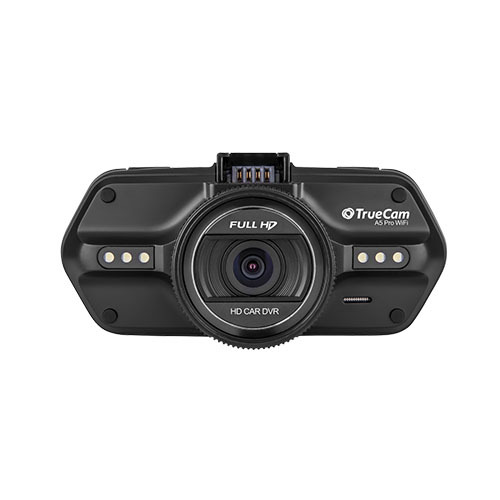 The TrueCam A5 Pro WiFi can record in Full HD resolution, reliably recognizing all important objects, such as license plates of surrounding cars or the faces of the drivers. With a new powerful chipset and a frame rate of 30 fps, the camera captures fast-moving cars, cyclists, or pedestrians. All while retaining detail and focus, even in poor lighting conditions. No need to carry cables and adapters with you. As the name suggests, the TrueCam A5 Pro WiFi car camera has built-in wireless WiFi capability. To remotely control it, work with recorded footage, and view live what is happening, download the FinalCam App. It’s available for both Android and iOS smartphones and tablets. The TrueCam A5 Pro WiFi is equipped with a smart GPS module. In addition to capturing the precise GPS position of your car, it also measures and records the speed of the trip. You also have the option to see your speed in the video or just save it in the GPS data. If you do not want to see the speed in the video, just turn it off. You can then review all recorded data using the application on Google Maps. With a comprehensive database of stationary speed cameras, or traffic light cameras, TrueCam alerts you where it is good to take your foot off the acceleration pedal and be extra cautious. If selected, the camera can warn you using a voice alert and/or a message on the display, including warning you when the allowed speed limit is exceeded. The list contains more than 37,000 locations in 36 European countries including Russia. You can download a free update twice a year from our site or when registered be notified via e-mail when a new update becomes available. While driving you can also be entertained by funny comments from actor James Winter or one of eight other versions of the voice alerts. Like all premium dashboard camera models, the TrueCam A5 Pro WiFi has a built-in Speedometer. It constantly shows the speed you are driving at and its direction with a small compass shown on the display. In addition, you will see the distance to the nearest speed camera and its speed limit once approaching it. If you travel too fast, the alert will turn on and notify you in time to reduce your speed. The Speedometer is ideal for use as a screensaver, its pleasant colors will not distract you when driving at night. To prevent the camera from being handled too much during a busy day, the installation must be as easy as possible. Fortunately, fixing the TrueCam A5 Pro WiFi into the holder only takes only a few seconds. You can also easily remove it and take it with you. You will never have to spend too much time attaching the camera to the glass, connecting cables and power. In short, you just click and go. With the TrueCam A5 Pro WiFi dashboard camera you can record continuously. If the memory is full, the camera itself will write over the oldest recording. Just choose how long the individual videos are to be. You can choose between an interval of three, five or ten minutes. The shorter the video, the easier it is to send it wherever you want. You can also record videos in time lapse, just set the frame rate. With fewer frames per second, the memory card will record a much longer duration according to its capacity. At the same time, you will see the recording in fast mode. The G-sensor, also called gravity sensor, records the direction of movement in three axes and, in the event of an accident, detects where the impact came from. This is useful when trying to find out who is responsible for a collision. If the G-sensor evaluates the situation as dangerous, it automatically locks the recorded video to prevent it from being overwritten. You can also lock the videos manually by pressing a button. An important feature of the TrueCam A5 Pro WiFi is an LCD display that can be used to review the recorded footage, adjusts camera settings, or take advantage of the Speedometer function. 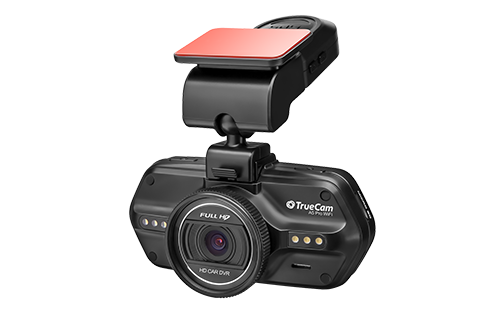 The TrueCam dashboard camera is completely in English, making its use easy and intuitive. See for yourself! No need to worry about your parked car anymore, the TrueCam A5 Pro WiFi can monitor its surroundings for up to 24h using the built-in battery. As soon as the device detects a movement via the G-sensor, it starts recording. If someone should hit your car and cause damage, you will have the evidence you need – including the license plate. 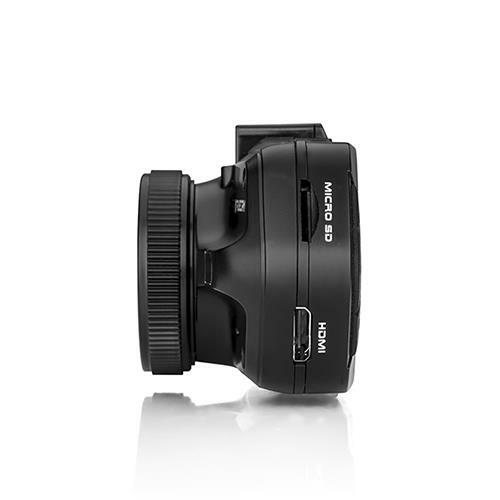 For the TrueCam A5 Pro WiFi dash cam, it is possible to easily attach a polarizing CPL filter or UV filter to the lens. The CPL polarizing filter eliminates glare, getting rid of unwanted light reflections especially from the windscreen. The UV filter improves colour saturation and vibrancy, the sky is darker and it removes haze on the distant horizon. These interchangeable filters are not included in the basic package. Regardless of the lighting conditions, you can be assured that the TrueCam A5 Pro WiFi black box camera takes clear shots every time, thanks to its high-quality lens and night mode. Filming or taking photos at night or in low light conditions is not a problem. 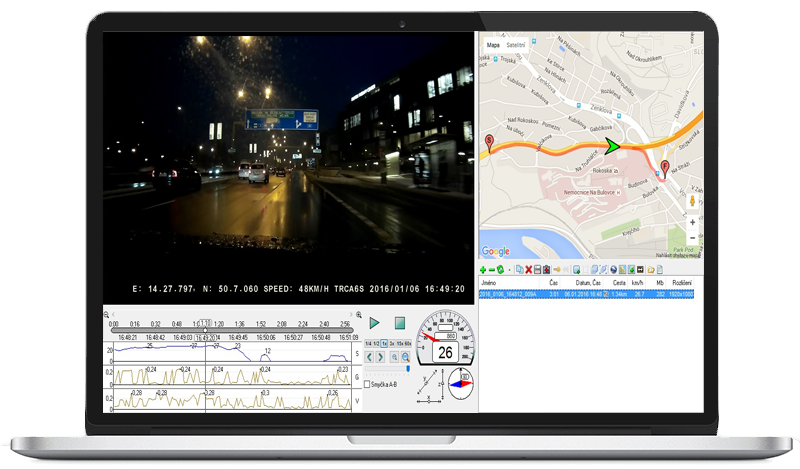 Software application – video display, speed and route map. All in one place. 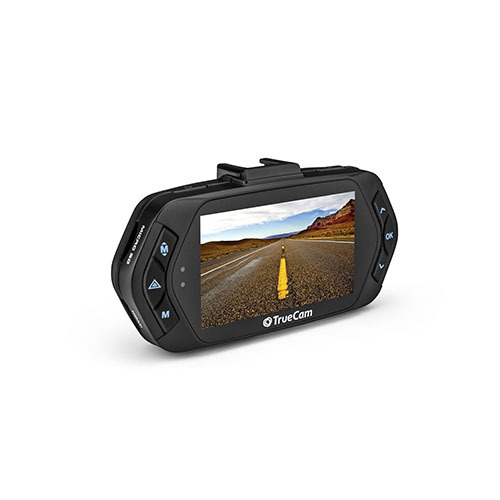 The TrueCam A5 Pro WiFi dash cam adapts to where you place it. It can therefore be mounted upside down. When you select the 180° rotation setting it reverses the image as well as the menu and everything will be displayed in the standard way. Similarly the videos and photos are recorded in the correct orientation. The TrueCam A5 Pro WiFi on-board car camera utilises GPS and Google Maps to display a convenient overview of the route of your journey. In the case of more frequent trips of a greater distance you can get a good idea of the speed and length of the journey and easily opt for the most efficient way. The TrueCam A5 Pro WiFi is installed with an application which displays the video, Google Maps and the speed graph on a single screen. Using the G-sensor the application also displays g-forces. For filming or shooting in the dark the TrueCam A5 Pro WiFi camera has a LED light source, which acts as an auxiliary light. It is a very useful tool for documenting accidents at night. By removing the camera from the windscreen it can be used like a standard digital camera to shoot any further damage or document evidence. The car camera has a dedicated button for taking photos. If you need to take a photo whilst recording, there are no complicated settings to adjust, you simply press the shot button. The TrueCam A5 Pro WiFi software also enables you to take a photo of previously recorded video by pressing the button. The TrueCam A5 Pro WiFi in-car camera offers a wide range of luminance, thanks to which you can precisely choose the most comfortable level. Before recording you can monitor it on the LCD screen to see which level suits you best. This is a particularly convenient feature, especially when your company uses multiple drivers. The name of each driver can be entered into the memory, so that in the event of any problems the driver can be easily identified. If this feature is turned on then the driver’s name is displayed on the recording. Although the TrueCam A5 Pro WiFi camera can see perfectly at night, unfortunately the same can not be said of us. Therefore for ease of operation in the dark, the camera has backlit keys. As a result, you do not need to use any other light source to control the camera or change the settings. As with all functions, if it is not needed this feature can be easily turned off. One of the many functions of the TrueCam A5 Pro WiFi is the ability to choose whether or not to display the vehicle speed on the video. It is up to you which option you choose. The GPS module allows for the option to display the location of the vehicle. If you do not want your location to be seen on the recording this function is easily disabled. TrueCam A5 Pro WiFi car camera – Secure the evidence online in case of an accident.